These earrings are 1 and 5/8" long by 1/2" wide. 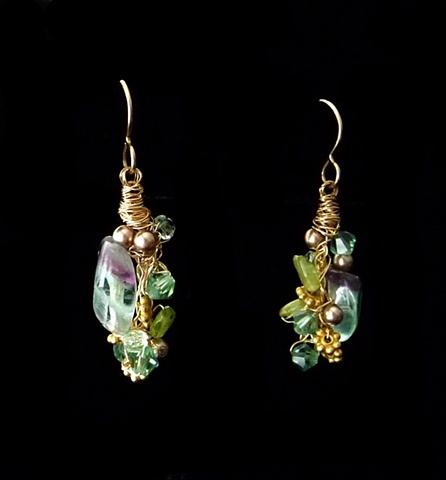 These 14k gold-filled wire earrings entwine Fluorite, Peridot, Swarovski Crystals, Swarovski Pearls, with Gold Vermeil Spacers. They hang like bunches of luscious, fresh, ripe fruit from 14k gold-filled ear wires. When I think about the perfect, peaceful, tropical retreat, I think of the Maya Tulum Resort. Located on the beautiful Yucatan Peninsula of Mexico, it is a seaside wellness retreat that offers amazing serenity, awe-inspiring scenery, and a true connection with the Mayan past. The climate is ideal and the sun shines all year with cooling sea breezes and glorious clear skies.